I've had so many of my sweet readers ask me lately about our plans for selling our house, so I wanted to talk about where we were when we started our debt-free journey, where we are now financially, the reasons why we're selling, and our future housing plans. You've probably heard some crazy stories about the things that people have done in order to pay off their debt. 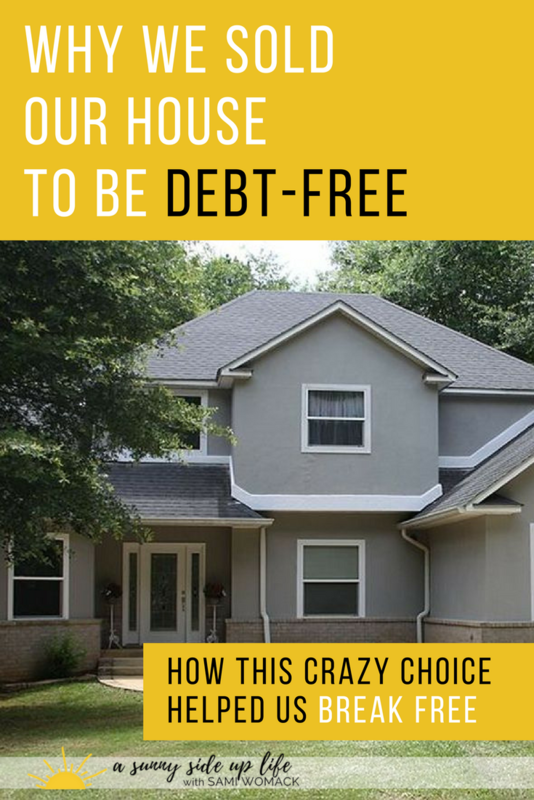 You've probably heard of people selling their cars, getting rid of their cable, cutting coupons, but have you ever heard of people so crazy about becoming debt free that they sold their house!?! ...well, that's what we're doing! Back about 3 years ago when we first started on our debt free journey we started with about $490,000 worth of debt! That was medical bills, credit cards, property taxes, IRS bills, our third daughter Melanie's birth (that happened in the middle of all of this), a few more miscellaneous debts that happened over those years, a piece of commercial real estate, our old house that we turned into rental property, and our current house. Fast forward 3 years, everything is paid off (our other real estate has been sold), and we're only left with the debt on our house of $265,000! ...but we want that debt gone too! When we first moved into this house we only had one child, and we thought we would grow into the 3,200 square feet. Well, now we have 3 children, we're done having babies, and the house is still too big! After pursuing Minimalism and down sizing about half of our belongings we realized that we just don't need this big of a house. The thing about a big house is that it comes with big bills! It has bigger electric bills, higher property taxes, more expensive insurance, lots of maintenance costs, yard upkeep, and takes tons of time to keep everything taken care of. People sometimes forget to consider all of these things when they think about owning a bigger house, they just think about the monthly house payment. Even though we already save about 35% of our income, we want to save more! By selling this house and moving into a smaller rental we should be able to save an extra $1,000 a month. This is going to help us hit our financial goals way earlier than we'd be able to if we stayed in this house. This house also has a lot of emotion attached to it. My parents actually built this house, and they used to live here. However, after my dad pasted away it just became too much for my mom to take care of and she asked us if we wanted to take over so the house could stay in the family. This seemed like a great idea, and it has worked for us for the last 6 years, but financials reasons started to out-weigh sentimental reasons, and we decided it was time for a fresh start. I know this a touchy subject for a lot of people, and I've had a lot of people tell me that they could never move even if it's killing them financially...guys, I get it! My parents built this house, it was meant to be their forever home, but things happen, life happens, and plans change! There are a lot of memories we're leaving behind, some good and some bad, but it got to the point where we just had to move on, get a fresh start, and think about making new memories in our bright future. It was us in our "past life" who decided to live here, and debt-free us needs a clean slate! When we moved into this house we really couldn't afford it. We were drowning in debt, we struggled to make the monthly payment, we had no emergency fund, and no savings for repairs. So with getting a fresh start we really want to go into our new home the correct way from the beginning. We're now debt free, we have a 5-month emergency fund, and we're going to have a solid down-payment. Instead of playing catch up, this time we'll be able to do it right from the beginning. Like I said, my parents built this house, so it was their dream house. Of course we love this house, it's beautiful, but honestly it's not our dream. We finally realized that if we're going to spend this much money, and work hard to payoff this much debt, it's going to be for our dream! ...and I want to encourage you to consider the same thing! First of all, we want to get this house sold and have that $490,000 of debt in the past! Then, we plan to rent for a year or two depending on if we find a place that we love and depending on how our savings is looking. Mostly we want to just take a break from the responsibilities of home ownership for a little while and enjoy the freedom! We plan to take the money that we've currently been saving (above our 5-month emergency fund), add in the little bit of profit that we'll get when our house sells, and then add in the extra money we'll be saving from renting to have a really great down payment for our future dream house. Our minimum down payment goal is 20%, but depending on how long we rent we might be able to save closer to 30% to put towards our new house in the future....which is a great recommended percentage. We do plan to finance our future home with a great down payment and a loan for no more than 15 years. Even though we have financed our past real estate for 20-30 years, now after going through this whole debt-free journey that seems like a really long time to be in debt. We really don't want to spend our whole lives working just pay for a house...that seems really silly! Our goal for paying off our future home is 7-9 years, but we'd love to keep it closer to 5 years! So we plan to keep that goal in mind for our price range when we start shopping for another house in the coming years. Like I mentioned before, we really just want to do things in the correct order from the beginning. We want to go into home ownership next time with no debt, an emergency fund, a great down payment, and really have a great financial foundation for our new house. In January 2018 we finally sold our house! This house sale made us 100% debt free! We're currently renting a small 2-bedroom, 1-bathroom house in order to save money. This house is allowing us to save about $1,400 more per month than our old house! An added perk to moving into such a small house is that we had to sell most of our belongs, which gave us an extra $2,000 that we got to throw into our savings! Even though we are a little crowded in this house with 5 people and 1 dog...and even though we don't have central A/C or heat, or a dishwasher, or an indoor laundry room...we love the simplicity this tiny house has brought to our lives...and the extra money it's brought to our bank account! This isn't forever, but this is a sacrifice that we're willing to make for now! I know it seems crazy, but before all of this, we had never even considered moving in order to get out of debt. Now, knowing that we can have a HUGE chunk of our debt gone by just selling our house is a big weigh off! I know some people will say that they can't sell because they won't make any profit, but you've got to think about the long term picture. Think about how much money you really owe on your house, and think about how far you could go with your dreams if you had that money free. Think about how much you'll be able to save to hit those long term amazing goals that you have. I just want to encourage you if you've never consider this as a way to get out of debt to definitely consider it! It's a great option that a lot of people don't talk about. You can cut coupons, get rid of your cable, and of course those things are helpful, but if you really want to get serious and pack a huge punch to your debt then this is a great way to do it! ...the freedom is going to be so so worth it!